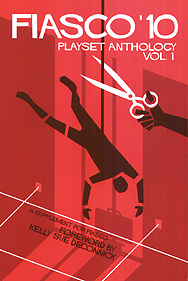 The playset is the still-beating-but-stolen-by-organleggers heart of Fiasco, and inside this first Anthology volume you'll find thirteen sterling examples of the form - twelve that held a place of honour as a Playset of the Month, and an extra one written by Fiasco designer Jason Morningstar specifically to accompany them here. This is not a complete game. You need a copy of Fiasco to enjoy these playsets.